The Doppler effect (or the Doppler shift) is the change in frequency or wavelength of a wave (or other periodic event) for an observer moving relative to its source. It is named after the Austrian physicist Christian Doppler, who proposed it in 1842 in Prague. It is commonly heard when a vehicle sounding a siren or horn approaches, passes, and recedes from an observer. Compared to the emitted frequency, the received frequency is higher during the approach, identical at the instant of passing by, and lower during the recession. When the source of the waves is moving towards the observer, each successive wave crest is emitted from a position closer to the observer than the previous wave. Therefore, each wave takes slightly less time to reach the observer than the previous wave. Hence, the time between the arrival of successive wave crests at the observer is reduced, causing an increase in the frequency. While they are travelling, the distance between successive wave fronts is reduced, so the waves "bunch together". Conversely, if the source of waves is moving away from the observer, each wave is emitted from a position farther from the observer than the previous wave, so the arrival time between successive waves is increased, reducing the frequency. The distance between successive wave fronts is then increased, so the waves "spread out". Doppler first proposed this effect in 1842 in his treatise "Über das farbige Licht der Doppelsterne und einiger anderer Gestirne des Himmels" (On the coloured light of the binary stars and some other stars of the heavens). The hypothesis was tested for sound waves by Buys Ballot in 1845. He confirmed that the sound's pitch was higher than the emitted frequency when the sound source approached him, and lower than the emitted frequency when the sound source receded from him. Hippolyte Fizeau discovered independently the same phenomenon on electromagnetic waves in 1848 (in France, the effect is sometimes called "effet Doppler-Fizeau" but that name was not adopted by the rest of the world as Fizeau's discovery was six years after Doppler's proposal). In Britain, John Scott Russell made an experimental study of the Doppler effect (1848). f = c - 0/c + 0.7c f0 = 0.59 f0 . f = c - 0/c + c f0 = 0.5 f0 . f = c - 0/c + 1.4c f0 = 0.42 f0 . "The reason the siren slides is because it doesn't hit you." where is the angle between the object's forward velocity and the line of sight from the object to the observer. 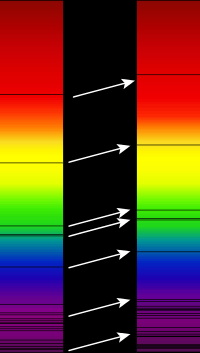 The Doppler effect for electromagnetic waves such as light is of great use in astronomy and results in either a so-called redshift or blueshift. It has been used to measure the speed at which stars and galaxies are approaching or receding from us; that is, their radial velocities. This may be used to detect if an apparently single star is, in reality, a close binary, to measure the rotational speed of stars and galaxies, or to detect exoplanets. (Note that redshift is also used to measure the expansion of space, but that this is not truly a Doppler effect.) This redshift and blueshift happens on a very small scale, if an object is moving toward earth, there would not be a noticeable difference in visible light . Among the nearby stars, the largest radial velocities with respect to the Sun are +308 km/s (BD-15°4041, also known as LHS 52, 81.7 light-years away) and -260 km/s (Woolley 9722, also known as Wolf 1106 and LHS 64, 78.2 light-years away). Positive radial velocity means the star is receding from the Sun, negative that it is approaching. 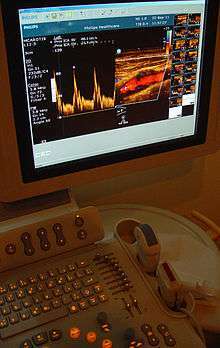 An echocardiogram can, within certain limits, produce an accurate assessment of the direction of blood flow and the velocity of blood and cardiac tissue at any arbitrary point using the Doppler effect. One of the limitations is that the ultrasound beam should be as parallel to the blood flow as possible. Velocity measurements allow assessment of cardiac valve areas and function, any abnormal communications between the left and right side of the heart, any leaking of blood through the valves (valvular regurgitation), and calculation of the cardiac output. Contrast-enhanced ultrasound using gas-filled microbubble contrast media can be used to improve velocity or other flow-related medical measurements. Fast moving satellites can have a Doppler shift of dozens of kilohertz relative to a ground station. The speed, thus magnitude of Doppler effect, changes due to earth curvature. Dynamic Doppler compensation, where the frequency of a signal is changed multiple times during transmission, is used so the satellite receives a constant frequency signal. During the segmentation of vertebrate embryos, waves of gene expression sweep across the presomitic mesoderm, the tissue from which the precursors of the vertebrae (somites) are formed. A new somite is formed upon arrival of a wave at the anterior end of the presomitic mesoderm. In zebrafish, it has been shown that the shortening of the presomitic mesoderm during segmentation leads to a Doppler effect as the anterior end of the tissue moves into the waves. This Doppler effect contributes to the period of segmentation. Since 1968 scientists such as Victor Veselago have speculated about the possibility of an inverse Doppler effect. The experiment that claimed to have detected this effect was conducted by Nigel Seddon and Trevor Bearpark in Bristol, United Kingdom in 2003. Researchers from many Universities like Swinburne University of Technology and the University of Shanghai for Science and Technology showed that this effect can be observed in optical frequencies as well. This was made possible by growing a photonic crystal and projecting a laser beam into the crystal. This made the crystal act like a super prism and the inverse Doppler effect could be observed. ↑ Florian Ion, Petrescu. A New Doppler Effect. Books on Demand. p. 81. ISBN 3848229900. ↑ Alec Eden The search for Christian Doppler,Springer-Verlag, Wien 1992. Contains a facsimile edition with an English translation. ↑ Buys Ballot (1845). "Akustische Versuche auf der Niederländischen Eisenbahn, nebst gelegentlichen Bemerkungen zur Theorie des Hrn. Prof. Doppler (in German)". Annalen der Physik und Chemie. 11: 321–351. Bibcode:1845AnP...142..321B. doi:10.1002/andp.18451421102. ↑ Fizeau: "Acoustique et optique". Lecture, Société Philomathique de Paris, 29 December 1848. According to Becker(pg. 109), this was never published, but recounted by M. Moigno(1850): "Répertoire d'optique moderne" (in French), vol 3. pp 1165-1203 and later in full by Fizeau, "Des effets du mouvement sur le ton des vibrations sonores et sur la longeur d'onde des rayons de lumière"; [Paris, 1870]. Annales de Chimie et de Physique, 19, 211-221. Becker (2011). Barbara J. Becker, Unravelling Starlight: William and Margaret Huggins and the Rise of the New Astronomy, illustrated Edition, Cambridge University Press, 2011; ISBN 110700229X, 9781107002296. ↑ Scott Russell, John (1848). "On certain effects produced on sound by the rapid motion of the observer". Report of the Eighteenth Meeting of the British Association for the Advancement of Science. John Murray, London in 1849. 18 (7): 37–38. Retrieved 2008-07-08. ↑ Strutt (Lord Rayleigh), John William (1896). MacMillan & Co, ed. The Theory of Sound. 2 (2 ed.). p. 154. ↑ The distinction is made clear in Harrison, Edward Robert (2000). Cosmology: The Science of the Universe (2nd ed.). Cambridge University Press. pp. 306ff. ISBN 0-521-66148-X. ↑ Evans, D. H.; McDicken, W. N. (2000). Doppler Ultrasound (2nd ed.). New York: John Wiley and Sons. ISBN 0-471-97001-8. ↑ Soroldoni, D.; Jörg, D. J.; Morelli, L. G.; Richmond, D. L.; Schindelin, J.; Jülicher, F.; Oates, A. C. (2014). "A Doppler Effect in Embryonic Pattern Formation". Science. 345: 222–225. Bibcode:2014Sci...345..222S. doi:10.1126/science.1253089. PMID 25013078. ↑ Kozyrev, Alexander B.; van der Weide, Daniel W. (2005). "Explanation of the Inverse Doppler Effect Observed in Nonlinear Transmission Lines". Physical Review Letters. 94 (20): 203902. Bibcode:2005PhRvL..94t3902K. doi:10.1103/PhysRevLett.94.203902. PMID 16090248. Lay summary – Phys.org (May 23, 2005). Doppler, C. (1842). Über das farbige Licht der Doppelsterne und einiger anderer Gestirne des Himmels (About the coloured light of the binary stars and some other stars of the heavens). Publisher: Abhandlungen der Königl. Böhm. Gesellschaft der Wissenschaften (V. Folge, Bd. 2, S. 465-482) [Proceedings of the Royal Bohemian Society of Sciences (Part V, Vol 2)]; Prague: 1842 (Reissued 1903). Some sources mention 1843 as year of publication because in that year the article was published in the Proceedings of the Bohemian Society of Sciences. Doppler himself referred to the publication as "Prag 1842 bei Borrosch und André", because in 1842 he had a preliminary edition printed that he distributed independently. Wikimedia Commons has media related to Doppler effect. Wave Propagation from John de Pillis. An animation showing that the speed of a moving wave source does not affect the speed of the wave. Doppler Shift Demo - Interactive flash simulation for demonstrating Doppler shift.